The excavation of Stump 3 illustrates how archeologists took advantage of a natural calamity and storm-wrought damage to the site. This tree grew in the southern part of the presidio enclosure between the south palisade and several barrack buildings shown on the Urrutia map. Examination of the stump block showed intact layering and rich midden deposits probably representing refuse discarded through time as the barracks were cleaned out. Avery excavated the large stump block much like archeologists normally excavate test pits. But this was essentially an inverted excavation block with the great advantage that Avery was able to clean and examine the wall profiles of the block before he excavated it. 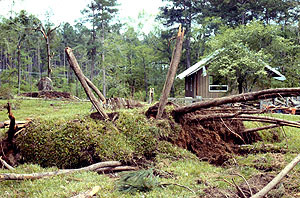 A severe storm knocked down over 100 trees at Los Adaes in 1993. Trees that were less than 50 cm snapped off above the ground, but trees that were greater than 50 cm in diameter did not break, but rather uprooted, and depending on the size of the tree, caused damage to the archeological deposits. Only the stumps of these trees remained in 1995 when Avery started as Station Archeologist. Under his direction, each of the stumps was numbered, and plans made for excavation of many of them. It was decided to leave the stumps inside and adjacent to the presidio and to excavate them when school groups would visit so that the students could see an excavation in progress. Students also could water screen deposits that had been excavated. The teachers asked the students to “dress to get dirty,” and the water screening station proved to be a favorite among the students. Most of the disturbed area of Stump 3 was excavated over a three-year period. Stump 3 covered a large area, so it was excavated in 1-x-1 meter units. Three zones were observed. Zone 1 was a silty loam with few artifacts and appeared to be topsoil that had built up around the tree. Zone 2a was dark yellow brown sand and also contained few artifacts. Zone 2b was yellowish red silty clay with a high density of artifacts. 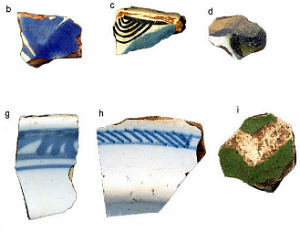 Albisola lead-glazed redware (made in Italy), which dates post-1750, was recovered from Zones 1 and 2a, but not from Zone 2b. Similiarly, Rouen Polychrome, which dates post-1770, has been recovered in Zones 1 and 2a, but not from Zone 2b of the Stump 3 excavations units. In other words, the layered deposits formed over the life of the presidio, with the lowest zone forming before 1750. Large quantities of Native American pottery and bone fragments from large mammals—probably mostly cattle—were the dominant artifacts, but Spanish, French, Asian, and German pottery sherds were recovered, along with iron nails, silver amulets, and other unidentified metal artifacts. All the artifacts were small fragments, which suggested that they had been dumped on the ground surface and walked on. Larger fragments of artifacts are found in trash pits because no animals or people walk on the trash when it is dumped in a pit. No postmolds were observed. Sometimes the rotten roots from the tree gave the appearance of postmolds, but when these areas were excavated, it was clear that they were areas where roots had rotted in place and gave the soil a dark color. The pottery sherds recovered from Stump 3 (mostly from Zone 2b) included 896 Native American sherds, 31 majolica sherds, 29 faience sherds, 5 British or Dutch tin-enameled sherds, 6 Asian porcelain sherds, 2 Italian lead-glazed sherds, and 2 German stoneware sherds. Most of the Stump 3 Native American pottery sherds have plain surface treatment, with 85% plain, 12% incised, 1.5% engraved, and 1.5% punctated. The surface treatment and temper analysis revealed no significant variation in surface treatment between zones, but there was variation in temper between the zones. Over all, there is an increase in the percentage of shell over bone temper from the lower to the upper zones. A total of 6,169 animal bone fragments were recovered—the great majority of these were too small to identify what type of animal they were, and about half of the bone fragments were burned. A total of 323 fragments of 18th-century glass was recovered—most appeared to be bottle glass. Beads recovered from Stump 3 excavations numbered 600 —most of these are less than 4 millimeters in diameter and are called “seed” beads because of their small size. 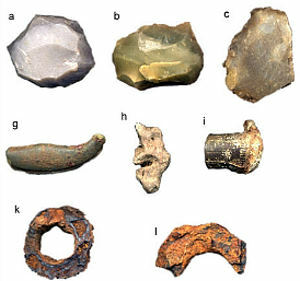 Metal artifacts were not great in quantity, but included iron nails, thimbles, lead spillage (probably from making round bullets, or ball shot), gunflint fragments, and flint chips probably from trimming gunflints. Stump 3 is located in the area of the barracks inside the presidio. It is to be expected that there would be some artifacts discarded within the presidio, but the large numbers of artifacts in Zone 2b—particularly the large amount of animal bone—suggests that this trash deposit was taken from a dump area located nearby. The following interpretation of the Stump 3 deposits is a combination of what is known from the historical documents and what was observed from the archeological excavations. It is hypothesized that Stump 3 is in an area where a foundation was prepared for a barracks building that may never have been built. 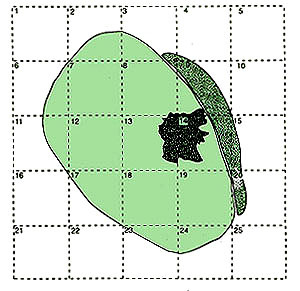 Zone 2a may represent a sandy cap laid over a deposit of silty clay mixed with trash (Zone 2b) which was deposited to create a level surface on the sloping interior of the presidio. The Zone 2b fill is a mixture of sand, clay, and artifacts. As such, it forms a stable base for the structure. Roadbed construction in areas poor in rock will often employ a mixture of sand and clay to serve as a base for the road. But the mixture is a fairly precise combination—too much sand will cause the base to crumble, and too little sand will result in damaging shrinking and swelling with exposure to moisture. The right combination of sand, clay, and other aplastics—such as midden artifacts—will result in a stable foundation. In much the same way as adding temper to clay for pottery making reduces shrinkage, so too would the presence of midden artifacts reduce the harmful effects of shrinkage. The documents indicate that Governor Winthuisen arrived at Los Adaes in 1741 and proceeded to build seven new barracks and platforms for two other barracks to be constructed later. It is interesting that only five barracks are depicted on the 1767 Urrutia map. The Stump 3 area may represent a foundation platform prepared for a barracks that was never constructed, or it may be one of the seven barracks buildings built by Winthuisen that was demolished sometime before 1767. In either case, a level foundation surface was required. This surface was created with a mixture of clay, sand, and garbage—possibly from the nearby defensive ditch that may have been used as a dump, given the lack of any serious military threat from either the French or the Caddo peoples. 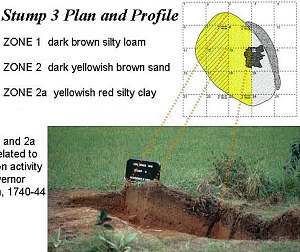 Given this scenario, the clay/sand/garbage fill zone of Stump 3—Zone 2b—would consist of pre-1741 material. So far, no artifacts dating after 1741 have been identified in Zone 2b. Also, the small size of all artifacts and the fact that much of the bone fragments were burned, supports that the artifacts were dumped in the area, burned, and then subjected to foot traffic—by either humans or domesticated animals. This would be the case in garbage being dumped and burned in the fosa, or defensive ditch just outside the presidio wall. For such a ditch to be an effective deterrent to an armed assault, its depth would have to be maintained. Governor Winthuisen may have ordered the cleaning of the ditch, and the mixing of clay with the trash removed from the ditch to serve as foundations for the new barracks may have been a by-product of the overall improvement effort at the presidio. The Stump 3, Zone 2b material appears to represent a wide variety of activities within the presidio prior to 1741. Los Adaes was a military installation, but exclusively military artifacts were not recovered from the Stump 3 units. The activities of metalworking, bullet making, and gunflint trimming are indicated by slag, lead splatter, and lithic chipping debris. However, these activities can be both for military and non-military purposes. Subsistence-related artifacts dominate the assemblage. Faunal remains and Native American pottery fragments are by far the most abundant artifacts recovered from the Stump 3 units. Almost all the faunal material is large domesticated mammal—no fish are in the sample. 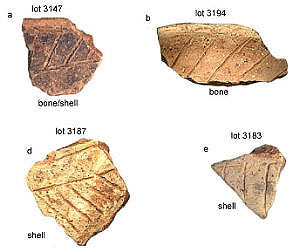 Pottery fragments, representing food transportation, storage, and consumption, are primarily Native American. The roughly equal amounts of Spanish and non-Spanish ceramics fit the overall pattern for Los Adaes. Stump 3 (the grass-covered raised block on the left) as it appeared in 1993 soon after the storm damage. Photo by Jeff Girard. Stump 3 as it appeared in 2002 when excavation and documentation began. The grass cover had protected this stump block, which had been "reserved" for later excavation while other stumps in more precarious condition were salvaged. Photo by George Avery. 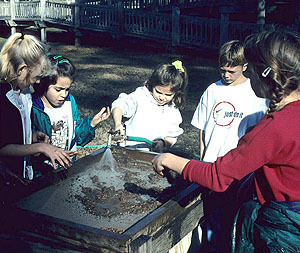 Students from a third grade class of the Northwestern State University Lab School that visited Los Adaes SHS in 2000 and participated in the water screening of deposits excavated from Stump 3. Photograph by Wendy Lott. Plan map of the Stump 3 excavation block. 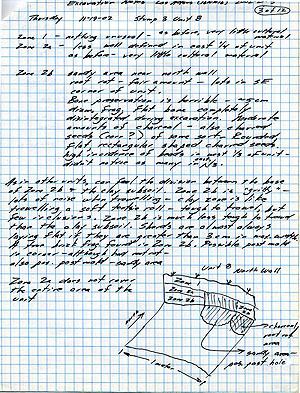 Avery's field notes for November 19th, 2002. 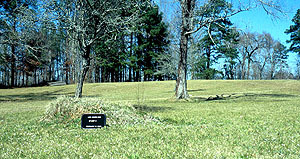 Unit B is one of the 1-meter--square divisions of the stump block, the above-ground equivalent of a normal archeological excavation square. Plan and Profile of Stump 3. 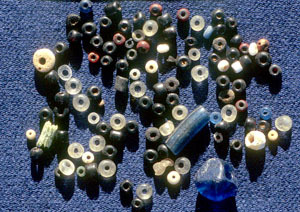 Glass trade beads, many of them quite tiny, recovered from the Stump 3 excavations. The use of water screening allowed Avery to capture artifacts that would have passed through the standard 1â€¦4-inch screen mesh most archeological excavations use. Native American pottery from the Stump 3 excavations. From Avery 2004. Enlarge to see more items. European pottery from the Stump 3 excavations. From Avery 2005. Enlarge to see more items. Metal, stone, and glass artifacts from the Stump 3 excavations. From Avery 2005. Enlarge to see more items.